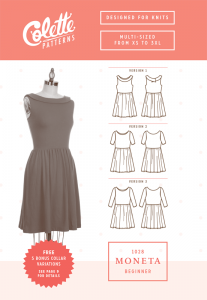 According to the Colette Patterns website the Moneta pattern is the new go-to dress pattern. Built for both elegance and comfort, this simple knit dress works in every season and for any occasion. Made with knit fabric, with minimal pressing and just a few pattern pieces, an army of these wardrobe workhorses can be whipped up in a few hours. Moneta is easy to make, and easy to wear. This dress is versatile, layerable, and above all, comfortable. All three styles of Moneta dresses have a gently curved, wide neckline, a fitted bodice, and a shirred skirt with in-seam pockets. Version 1 is a sleeveless dress with a lined bodice and narrow round collar that laps at the centre back. Version 2 has an unlined bodice and short sleeves, while version 3 has an unlined bodice and ¾ length sleeves. Having checked the measurements chart and line drawings I decided to make version 3. 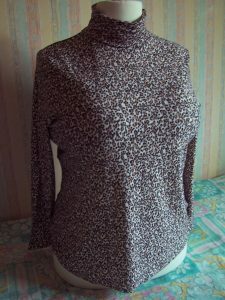 I cut the 2X pattern size but with an elbow-length sleeve. 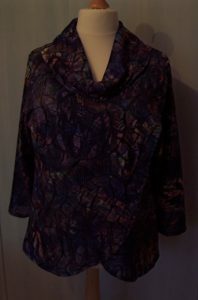 The fabric is a fine tee shirt weight jersey print (probably viscose/elastane) called “By the Pond” from Fabricland at £3.99/metre. Due to width of the fabric I was able to cut the pattern out from just 2 metres length. The instructions for making up the dress are comprehensive and I was glad of this as there was a new technique (for me) for gathering up the skirt to fit the waistline seam on the bodice. The technique involves the use of ¼ inch wide clear elastic that is ‘triple zig-zag’ stitched to the top edge of the skirt panels prior to attaching to the bodice. The method worked well and is something that I will use again. I have 8 metres of ¼ inch wide clear elastic so sufficient to make several more gathered skirts. Amanda did not manage to make her dress in one hour and neither did I. The main reason for this was that this was the first time I had made the dress and one of the things still taking me a long time is to sort out is neckline banding. For the first attempt I measured the length of the neckline, multiplied by 85% and added seam allowance. I attached the band to the neckline which involved a great deal of stretching of the band with the result that the neckline was brought up much too close to my neck and was no longer scooped. I re-cut another band a bit longer this time but still no joy. Third attempt – I cut a much longer piece of banding (2 inches wide x approximately 30 inches long). I folded in half and starting at a shoulder point, gently stretched whilst pinning to the right side of the neckline and matching all the raw edges. When I had completed pinning the circuit of the neckline, I cut the spare fabric, made a join in the banding and attached first with the sewing machine and then with the overlocker. Having top stitched the sleeve hems and the hem of the skirt I turned my attention once again to the neckline.With right side uppermost and the right hand needle stitching in the ditch, I stitched around the neckline again to ensure that the overlocked turnings would stay on the inside of the neckline (I used this method on the neckline of the Heather dress) and am delighted with the way it has turned out. So, in future I shall not try and second-guess the length of banding required, but simply cut a long length and take it from there. The completed dress fits well although I find that I did not cut the sleeves quite short enough and maybe next time I will lengthen the bodice. However, as I did not pre-wash the fabric I will not do anything else to the sleeves at present – let’s see how they fair after a wash.
As the fabric has a Black background the dress will be good for wearing now with opaque tights and a cardigan, then later with fine denier tights and later still, on its own. A great investment for an all-season garment. Still in jersey mode I decided to have another go at the Heather dress from Sew over It. Last time I used a winter weight jersey from Fabricland that was probably too stretchy. This time I am using a 32% Polyester / 60% Viscose / 8% Elastane Blend, Two tone Rose Jacquard Ponte Roma from the Textile Centre (£4.10/m) which I think is much more appropriate for this style. 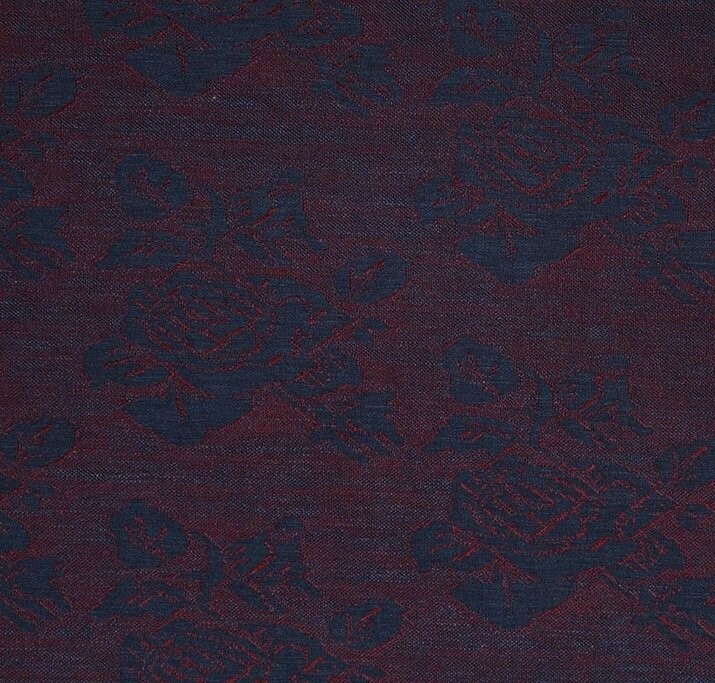 The right side of the fabric appears as Navy with a jacquard design of roses in Wine. The reverse (wrong) side appears as solid Wine colour although I could detect an imprint of the Roses design. 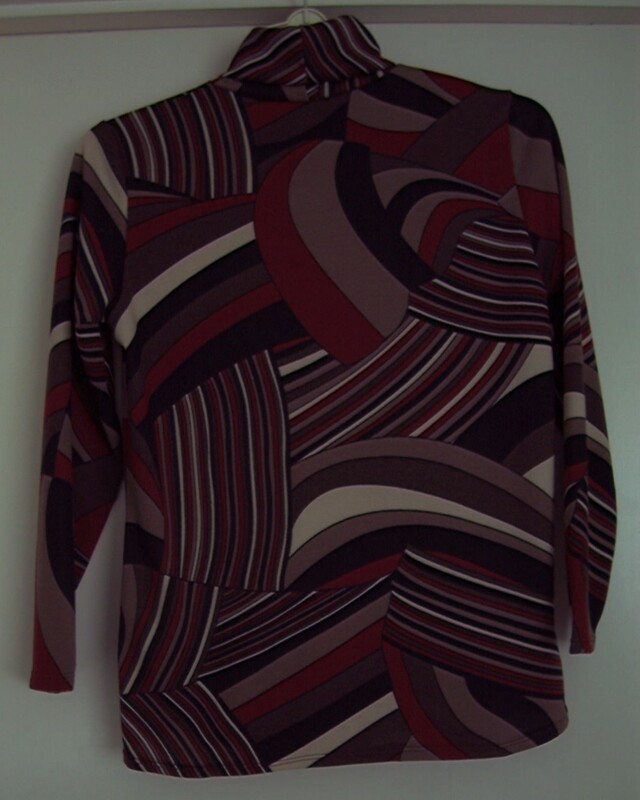 I originally planned to make the centre front and back panels of the dress in the solid Wine colour with the side panels and sleeves in the Navy but on close inspection decided I did not like the slight ‘cellulite’ effect of the jacquard design on the ‘wrong’ side. The entire dress was constructed in the Navy colourway using mostly the overlocker but with hems stitched with the jersey twin needle. 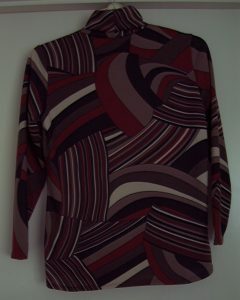 This fabric was a joy to sew and is much more suitable for the Heather dress. On first fitting I noticed that there was some excess fabric at the side seams under the arms down to the waist level. I re-stitched and have adjusted the pattern. To add a little more definition to the panel seams and pocket top edges on the front of the dress I have hand-picked some top stitching. I think this looks good and may well repeat on the back panel seams. 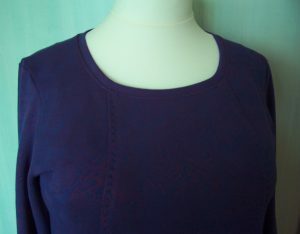 For the first time, I tried the standard ‘band’ finishing at the neckline. It worked well and I then top stitched with the twin needle, having the right hand needle ‘in the ditch’ and the left hand needle approximately 3-4mm away from the seam line. Having initially extended the sleeve lengths, I subsequently shortened them back to just above the wrist bone – not full length and not ¾ length either. Also having initially lengthened the dress by 2 inches, I have now cut that away to return to the original length. If I make the dress again I must remember to reduce the width of the shoulders as they extend beyond my natural shoulder by approximately 1 inch – something to be remedied when next I am ‘alteration mode’. Final analysis – The jury is still out as at present I am not convinced this style particularly suits my figure. The dress can be quite complicated to stitch with the pockets set into the front panels so takes a bit longer than other dresses e.g. 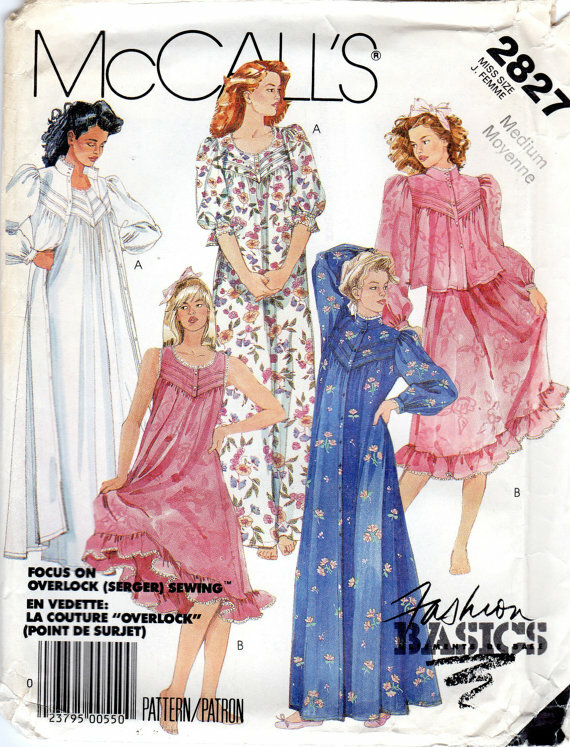 the ‘Moneta’ by Colette patterns. My journey exploring jersey fabrics continues. Whilst visiting the Sewing for Pleasure Show at the National Exhibition Centre, Birmingham I indulged in a buying feast of jersey fabrics and sewing patterns for knits. This project is the first in a series of NEW patterns and was inspired by seeing a visitor at the show wearing this same style made up in a cheerful textured Red jersey. From ‘The Shuttle’ stand at the show I purchased 4 metres of a multi-coloured ‘lacy’ knit fabric. I decided to make version A of the pattern but would add the cowl collar from view B. Having checked the Body measurements I decided to cut the XL size and hope that it would not be too big across the shoulders. When laying out the pattern pieces I noticed that the side panel could very easily be pinned to the main front panel and therefore remove an extra seam which when making the top in such a ‘busy’ fabric would get lost in the design. I changed all the threads on my JUKI Overlocker and re-set the sewing machine with a single jersey needle and Black threads. Now I was set to stitch! The construction of the top was straight forward and within a couple of hours was completed. I tried on the top and discovered that it fits well except that it is wider than I like across the shoulders. Next time I will cut the size ‘L’ and grade out at the waist and hips for my generous curves. Having extended the sleeves from ¾ length to full length, I found that they were quite wide. I ran the sleeves through the overlocker again and reduced the width at the hems by 2 inches grading to 0 at the underarm. I must remember to mark the pattern accordingly. 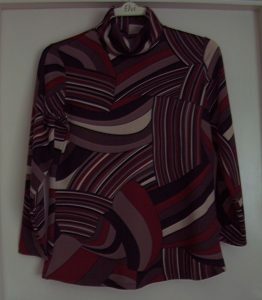 Having purchased 4 metres I found that I used only 3 metres so have just 1 metre left to make a basic shell top. More of that in another post. Paola no. 9 – Stripes! Feeling very confident sewing the Paola tops, I decided to add a challenge to the mix and make version no. 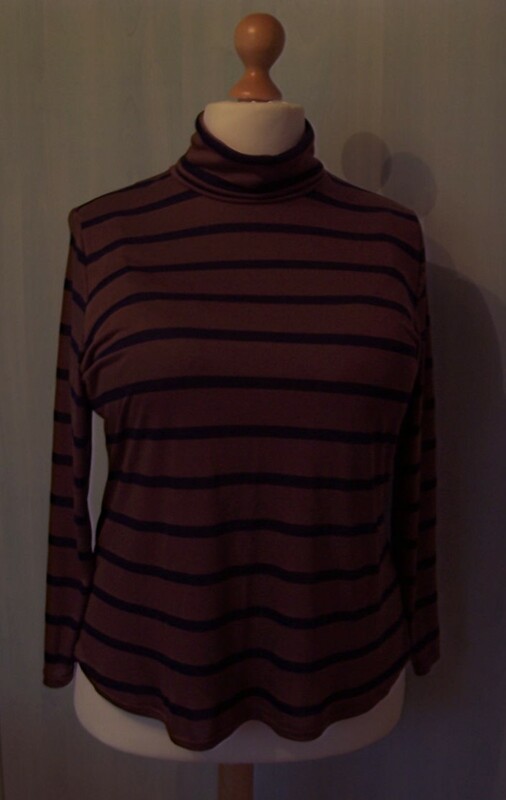 9 with a striped fabric. 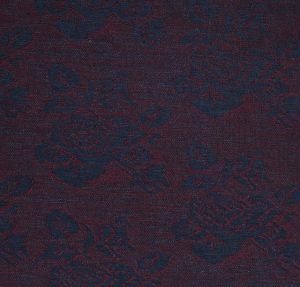 This fine Viscose jersey in Tobacco with a ½ inch wide stripe of Navy was purchased some time ago along with some other jersey fabrics from The Textile Centre (£2.60/m). Somehow it got buried under the stash and was rediscovered when I was looking for a different fabric. There is nothing new to say about this pattern except that I lengthened the bodice by 4 inches as the fabric was not pre-washed and is therefore likely to shrink when laundered. Matching up the stripes was challenging. One side seam is perfect, the other not quite so. As this is such a lightweight fabric it will be ideal to continue to wear until the ‘heat’ of the English Summer! 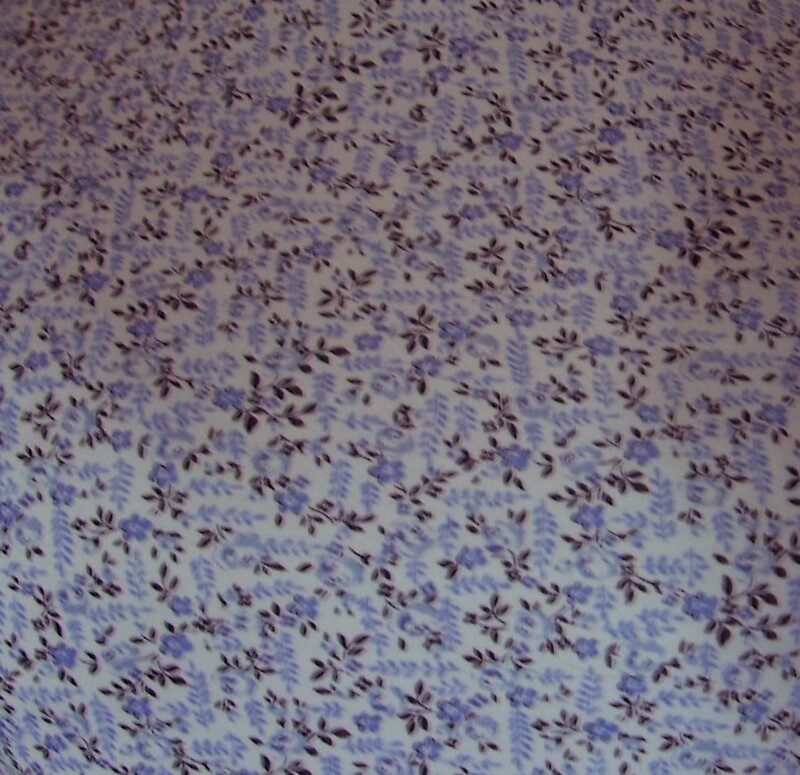 Next blog post is yet another jersey fabric but a completely new pattern! After several fairly straightforward projects mostly using my Juki overlocker I decided that I should now attempt something a little more challenging and also re-visit my newest Brother 550 Special Edition sewing machine. 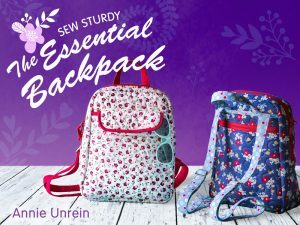 A very good friend has a birthday coming up so the Sew Sturdy Essential Back Pack by Annie Unrein on Craftsy would seem to be an ideal project. 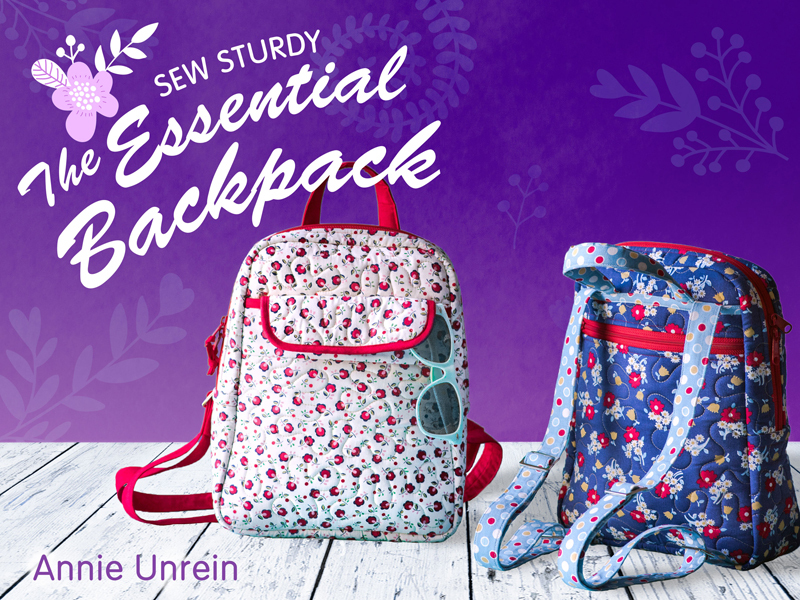 This stylish travel-friendly backpack has secure zipped closures and plenty of pockets to keep everything neat yet easy to access. 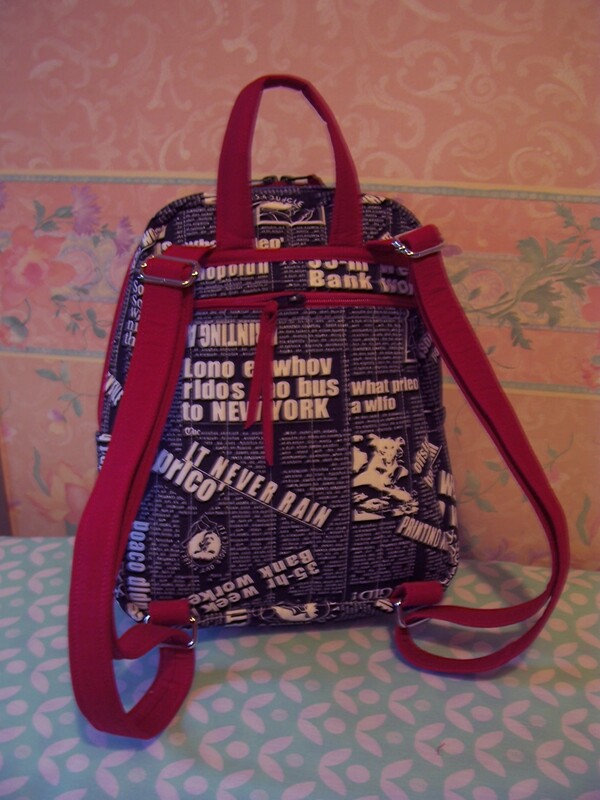 A quick grab padded handle and adjustable straps make it easy to carry and wear. 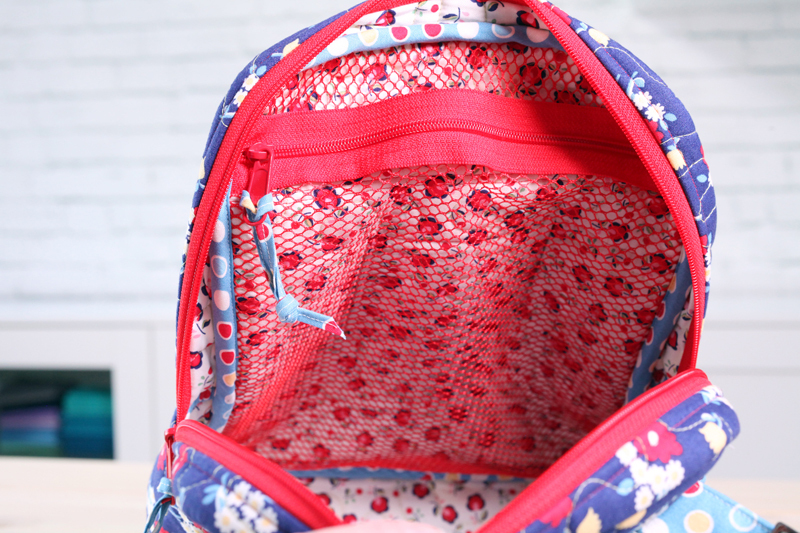 The backpack has a full zipped pocket on the back plus another inside. Two slip pockets on the side and two interior slip pockets provide easy access to water bottles, mobile phone, keys and more. The flap on the outer front pocket opens to reveal six slots for credit cards and ID. The backpack measures approximately 14” high and tapers from 12” wide at bottom to 9” wide at top and 5”deep at bottom to 3” deep at top. I decided to make the backpack in a main fabric print of Black & White ‘newsprint’ cotton with a lining of Grey floral print cotton both purchased from Fabricland. The contrasting binding was a plain Bright Red cotton came from my stash. Using the same procedure as that for the Organiser Sewing Case I first downloaded the Craftsy lesson to my Android tablet before assembling all the ‘ingredients’ for the project. First I had to prepare and quilt two large pieces of fabric, Bosal ® and lining sandwiches with channels set 1¼ inches apart. 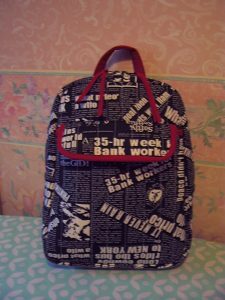 By watching each lesson, reading the class materials and then carrying out the lesson the backpack came together over the course of three intensive sessions of sewing. Although some of the procedures are the same as those utilised for the Organiser case, I still learnt some new techniques and enjoyed the challenge of a totally new project. I have delayed posting this project as it is for a good friend’s birthday and I did not want her to see the gift too soon and spoil the surprise! And finally, for now anyway – Paola no 8. 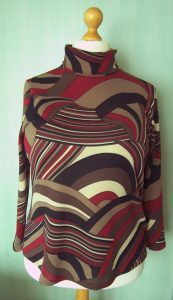 This is a repeat of the Warm Autumnal shaded jersey fabric but this time made in a size to fit my sister. I hope that she likes it and it fits! 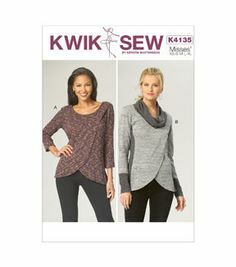 I have retained a copy of the pattern with the fitting adjustments that I made so if when we are shopping together we find some more jersey fabric that Catherine likes, I will be able to make another for her. Nothing much to say except that I bent my jersey twin needle and had to switch to a standard twin needle – fortunately no other problems. An item for the shopping list : Jersey machine needles, single and twin. I believe that you can also buy triple needles – that may be a step too far! Apart from a Paola in the warm Autumn shades to fit my sister, this is probably the last Paola that I shall make for some time – from here on in prepare for a batch of Paolinas. You have been warned! Yes, I know – yet another Paola – but know that I am now in the final furlong of making this particular top as a Polo neck I have ideas for a hack! 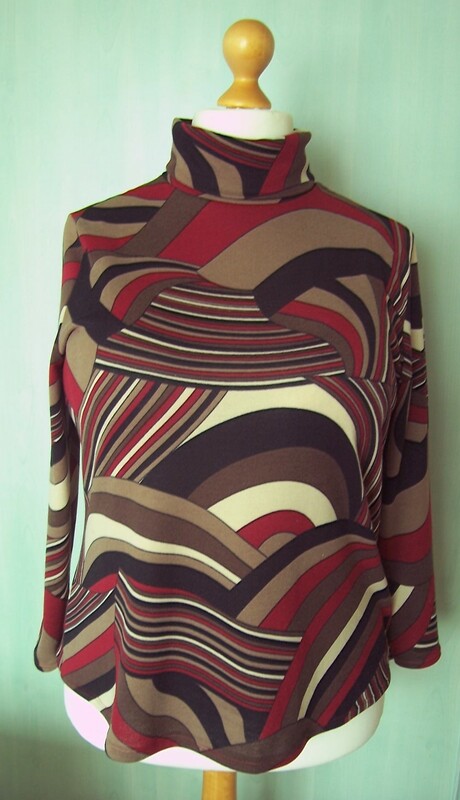 I can shorten the sleeves and make a scoop neckline so when that happens I shall call the design Paulina. For now I will re-cap on the alterations that I have made to the pattern so that it is exactly as I require it (for now). Firstly I have reduced the depth of the collar by 2 inches, the sleeves are also reduced in length by 2 inches but the body has been extended by 3 inches. 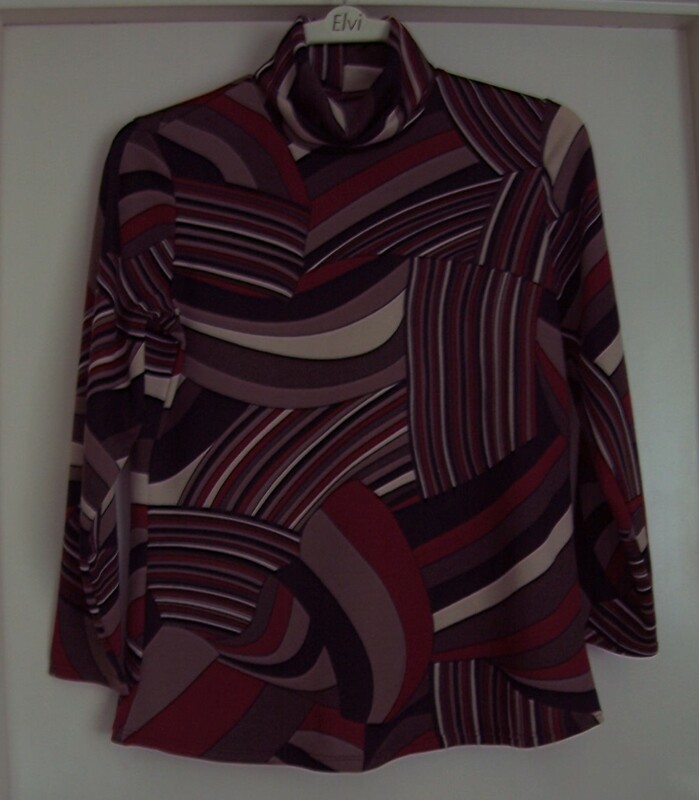 The fabric for this iteration came from the Salisbury branch of Franklins at £4.95/metre but less 10% discount so by using 1.5 metres, this top has cost the grand total of £6.66. I cannot remember the fibre composition but it has a slight nap and is lovely warm and cosy, just right for the March winds! 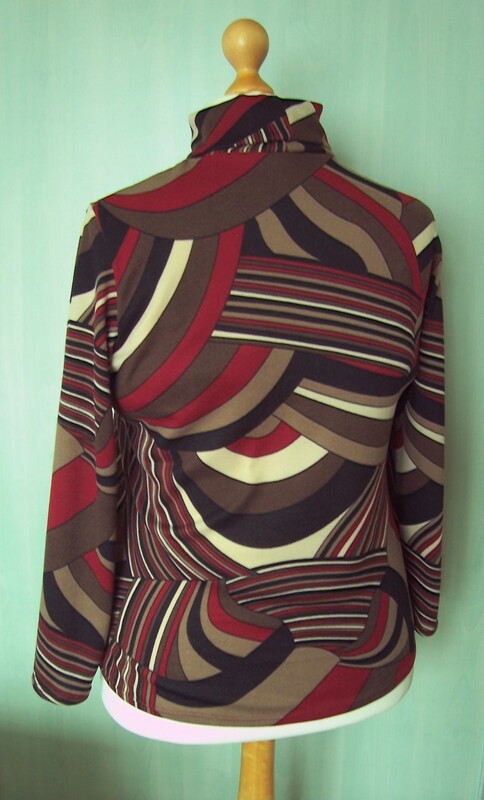 The print in Autumnal shades has a Pucci-esque feel and I ‘warmed’ to it the moment I saw it on the rack. The only other comment I would make is that I wish I had been a little more careful and noted the print placement but as it happens there is no glaring ‘mishap’ over the bust but I could do without the partial ‘target’ over my tummy! Hi everyone, by now you must all be heartily sick of looking at my Paola makes! But having recently completed a much more complex project, I felt the need for something very quick and easy for which a Paola top fits the bill admirably. Rooting about in my stash I came across this jersey fabric with a small leopard print. The length of fabric was just a small contribution to a very large consignment of fabric and sewing paraphernalia inherited from a great friend when she passed away a few years ago. 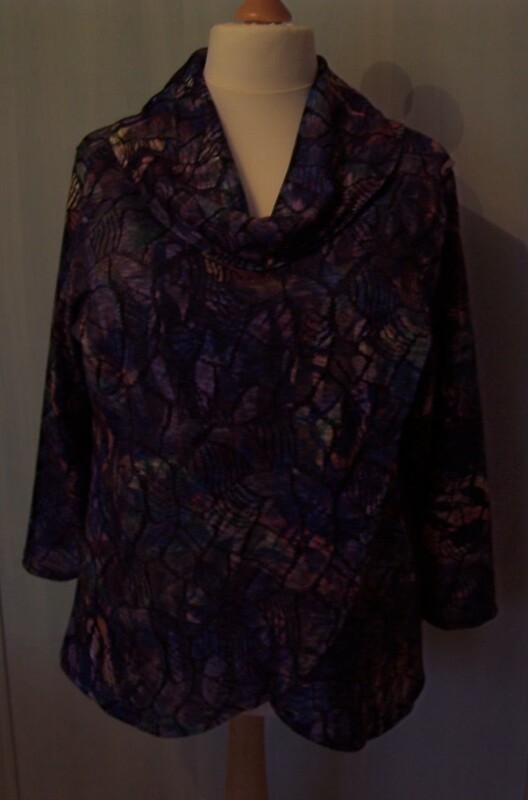 I have no idea of the fibre content but the fabric is very stretchy and has quite a synthetic feel – so not very warm to the touch but heigh ho – it is yet another top and a reduction to my stash! I won’t bore you with the construction details as it was a straightforward make, out of my ‘amended pattern’ envelope. 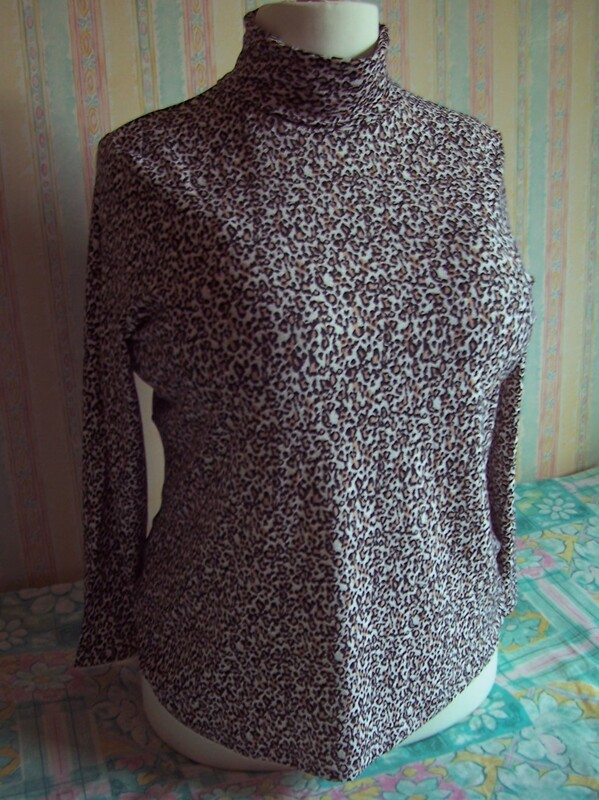 The top took just one hour to sew and looks very good with Black jeans. Details of the complex project mentioned above will be posted later in the month, once the recipient has received her birthday gift. A neighbour’s parents are currently downsizing and in the ‘clear out’ I have been the grateful recipient of several lengths of fabric. In return I have made a bespoke nightdress. There were several stipulations e.g. 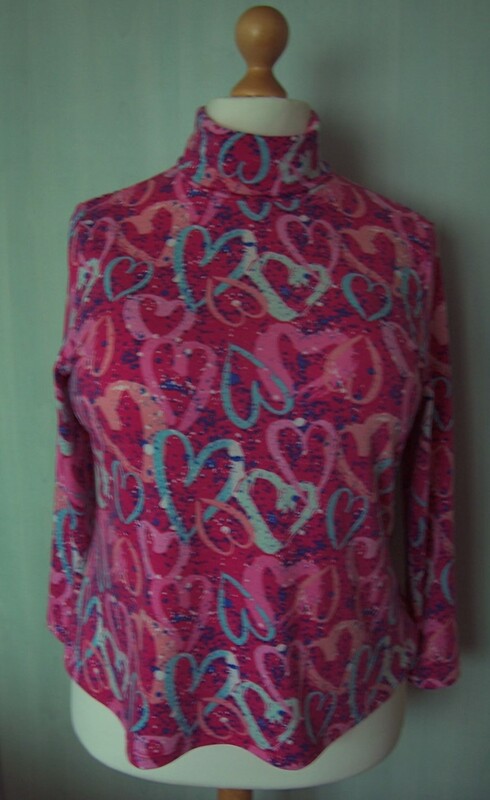 must be cotton jersey, must have long sleeves, be be full length – 58 inches and not Pink in colour. 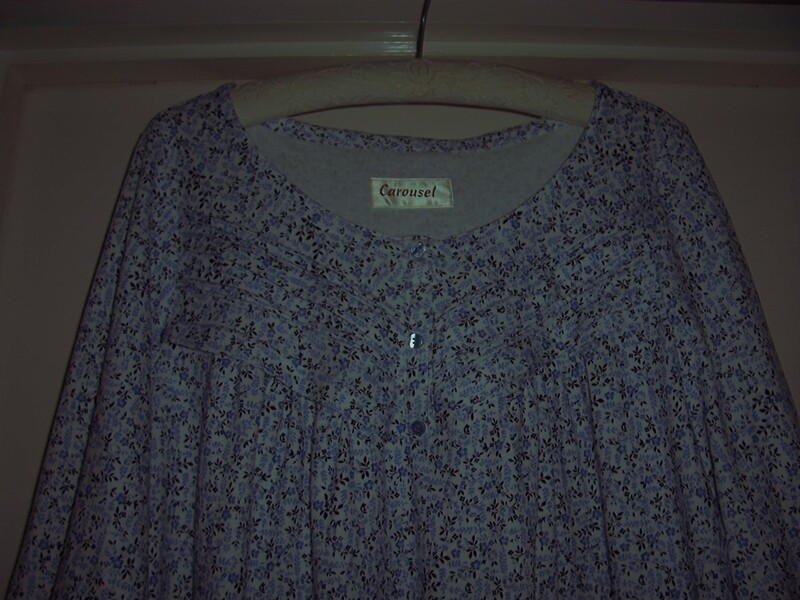 After a browse on the internet I also visited Salisbury and the local branch of Fabricland where I was fortunate to find some great cotton jersey with a ditsy floral print in Blue. I bought 3.5 metres at a cost of £3.59/metre. Searching through my patterns I found the one I was looking for which is McCalls 2827, a vintage pattern from 1986. I checked dimensions and cut out the nightdress. Although the pattern was originally drafted for a woven fabric I thought it would work in a jersey. Making the tucks on the two front bodice pieces was slightly problematical but I managed at least one good set, the first set being a little ‘haphazard’! Most of the stitching was done on the 4-thread overlocker. I drafted the long sleeves and cuffs which are circles with no fastening, made from double thickness of fabric. The neck binding was cut on the bias as a double fold. In the final check, I decided that the front placket was too thick to make buttonholes so the buttons are purely for decoration. 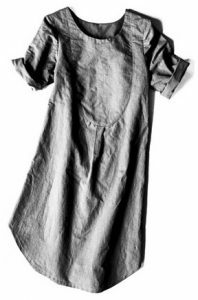 The scoop neckline provides sufficient space for the nightdress to be ‘pullover’ style. The hem is overlocked and finished with twin-needle stitching. Apart from a couple of small inconsistencies in the tucks I am very pleased with the result. 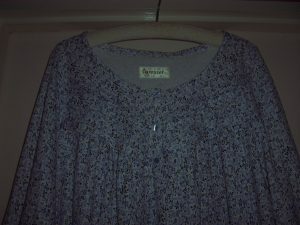 I will be looking for some more cotton jersey to make a second nightdress. 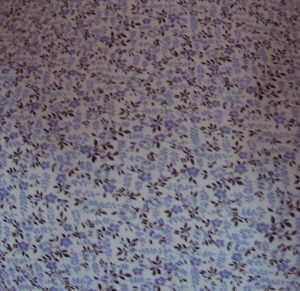 Next time I will use the Merchant & Mills pattern Dress shirt pattern that I have previously used to make a nightdress for me which I am confident will be easy to ‘hack’ to make a long-sleeved, full length version.